Tuesday’s Tip: Share Those Stories! 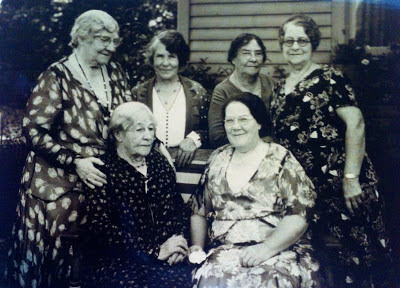 For as many stories as my relatives told about “the (Gaffney) Aunts” of Conneaut, Ohio, it seemed that I could find only a fraction of information about them in books and historic resources. home on Rocky River Drive, Cleveland, Ohio, 1932. The information available to me about my great-grandmother, Mary Jane, was more plentiful, mostly because it came directly from her children and grandchildren and was repeated often. But absent a few mentions in the federal censuses and scant other resources, I know little about the other sisters: Margaret, Elizabeth, Frances, Delia, and Agnes Gaffney. Maybe even sadder is that I have forgotten some of those stories I heard long ago. I should have written them down sooner. Stories are like languages. You have to practice them over and over again to keep them strong and vibrant and alive. If you don’t share them, the stories fade away into the recesses of your memory, depriving others of their richness and legacy. The details fade with the years until no one remembers what happened or why or to whom. And eventually, like some unused language, they die out quietly. Stories are especially important to remember people who may not have had children. They ensure that their memories will live on through their extended families, whether they may have been nieces and nephews or cousins who loved them and were loved by them. Someone dear to me once said they saw no reason for keeping sentimental memorabilia because they had no children to whom they could give these things. They could not imagine that anyone would care about them after they died. For this reason, the person decided to spare anyone the trouble of disposing of their memories – letters, photographs, and other hallmarks of their life – by shredding all those things. To the contrary, I believe that with very few exceptions in this life, whether today or in the future, we all will matter to someone. Admittedly, the rush of seeing how far back we can trace our family trees is a big motivator for this “genealogy thing” that we enjoy. But isn’t the greater reason for many of us to learn more about the people behind the names and the dates? Don’t we want to know why they made the choices that formed their lives, and how those choices affected our own experiences and identities? Don’t we want to know if they are like us, in some way? For the most part, raw data cannot answer those questions. That is where the stories come in and are so important to help us understand our personal and even wider histories. I have combed countless sources to learn more about my great-aunts, the Gaffney Sisters. In the coming days, you will learn more about some and less about others. If only they were here to tell their own stories or to chime in, “how right you were” or even “I wasn’t that way at all.” Instead, all I can do is share what I do have about them from my perspective and hope it does them justice. I remember my mother and my great-aunt telling me how full of fire and drive and passion these five women were. All but one of them spinsters, they doted on their nieces and nephews with hugs and kisses and more than a few mouth-watering cakes and cookies. They were all very close and enjoyed nothing more than a good Irish story and a hearty laugh. One of them (I don’t remember who) was “swapped out” from her infant basket for an Native American baby for a short while by its playful mother while my great-grandmother, Bridget (Quinn) Gaffney was hanging her laundry on the clothesline. I even know (all too well) that the sisters had what the family called the “Gaffney legs” – wide calves and flat feet, likely due to their happily well-fed forms. These infamous legs would become the dreaded standard comparison for many a female Gaffney descendant. Maybe I’m just being sentimental, but knowing these few things just doesn’t seem like enough. I wish I knew and remembered more about these delightful women than just a couple of paragraphs on a page. I am grateful for this, as there are many more people about whom I know nothing beyond their name, sometimes a partial one at that. It is hard to imagine that any of them ever wanted to be forgotten. They meant something to someone in their day, and they mean something to me and surely to others now. I owe who I am to them, in some unknown way. How I wish they could have known that they mattered to people who had not even been born yet. I cannot stress this enough. There is a purpose for every life on this planet, whether or not it is apparent today. Every person has a story, and every life deserves to be honored and remembered. Someone really will care and want need to know the whos and hows and whys of our lives. No matter how much or how little you may know about the people who were near and dear to you, don’t waste another minute. Keep those memories alive. Write them down, in a letter, on a blog, or in a scrapbook. Record them digitally. Recount them at the dinner table. Tell them to your young captive audience while you’re driving in the car. And then tell them again. And again. Lovely post Linda! And wonderful advice…"share those stories!" I heartily agree. Thank you so much, Jana! I'm loving your own Webster stories these days. Take care. Yes share those stories! I like how you crossed out want and put need instead. Great post! Thanks, Andrea. You do that so well in your own blog, and with great feeling, too! Linda, I loved how you conveyed so passionately how priceless the stories are! Often genealogist focus on the documentation, and don't give the stories their due respect! Like you, I am very passionate about the stories as they bring our ancestors to life! I can't wait to hear more about your great-aunts and what you've dug up! Thank you so much, Jana! I really appreciate that. Smadar, thank you! I think documentation and stories go hand in hand and must confess there's nothing more exciting than finding a vital record or tracing the signature of one of your forebears. As for my great aunts, they've had to wait a bit for me to catch up from a busy week! But their time is coming this weekend. Beautifully said! I've been in a slump, but you have given me a much-needed nudge. Thank you, Kathy! I find your own stories so inspiring, especially the one about your family's Bible. It prompts me to reexamine my own "forgotten" treasures. Have a good weekend!